Hand-held gun is a lightweight, effective spot cleaner. EXAIR's new Ion Air Gun combines incredibly fast decay rates with low compressed air consumption. It is the ideal way to remove static, contaminants and dust from three dimensional parts prior to assembly, packaging, painting or finishing. The Ion Air Gun neutralizes static electricity and cleans at distances up to 15 feet (4.6m). Because 80% of the delivered air is induced, the Ion Air Gun minimizes air consumption. The Ion Air Gun induces surrounding airflow through the gun at a ratio of 5:1, minimizing compressed air use and maximizing ionized airflow. The force can be adjusted from a "blast" to a "breeze". The Ion Air Gun is quiet, lightweight and features a hanger hook for easy storage. The 10 foot (3m) shielded power cable is extremely flexible, and designed for rugged industrial use. There are no moving parts to wear out. 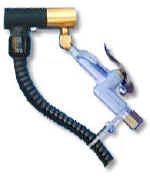 The Ion Air Gun incorporates a High Velocity Air Jet and electrically energized emitter point. A small amount of compressed air is injected into the barrel of the gun (1) inducing a high volume flow of surrounding air (2) to pass through it. The emitter point (shockless) at the discharge end of the gun (3) ionizes the entire airstream. The result is a high volume flow of ionized air (4) capable of neutralizing high static charges in fractions of a second. An optional filter and regulator cleans the compressed air and allows infinite adjustment of airflow and velocity. EXAIR Model 7901 or 7907 Power Supply (5 kV) is required for operation. Power supplies are equipped with a 6' (1.83m) power cord, lighted power switch and (2) high voltage outlets.